I am returning soon to the Sierra de Guadarrama, near Madrid, to complete my research for Book Three. Few people in the UK have heard of the Guadarrama, so it will be called “The Mountains of Madrid”. I have the help of Tim Price, a young Englishman who was born and bred in Madrid. We aim to have the book on the shelves in time for Autumn 2019. This is a brilliant walking area, with lots of easy, moderate and strenuous routes taking you to over 2,400 metres altitude. The views are long-distance and brilliant. And you get the chance to visit the famous capital city of Spain as well. In the spring of 2020 I will be leading a group, as often, from the wonderful Finca el Cerrillo in Canillas de Albaida. 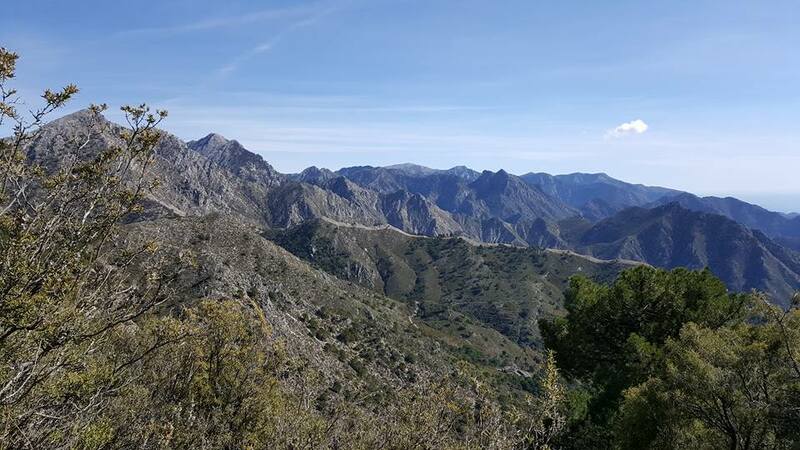 I will be taking the group on from there to Granada where they will walk in the Alpujarras, in the city of Granada, and in the Sierra Sub-Betica, which is half way between Granada and Córdoba. I am looking forward to returning to some of my old walking routes for the first time in a little while. I am pleased to say that I have recently received the following message from a person who bought my Picos de Europa book. The printers had made a mess of the third reprint, and had to print it over again. “I arrived home today to find your book delivered as promised. I have to say a big thank you for your exceptional customer service. 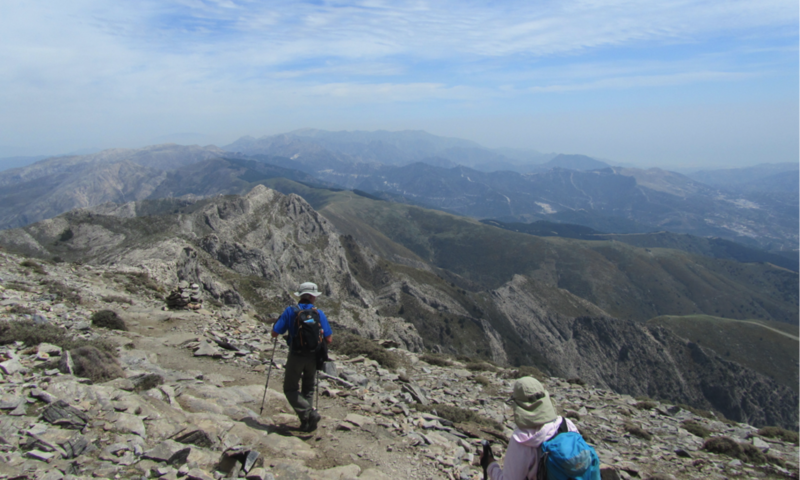 I am visiting the Picos in early summer and am looking forward to walking a few of the routes described. I spent a few days in the Sierra de Guadarrama over new year, working on Spanish Trails Book Three, “The Mountains of Madrid”. Then I headed south to lead another walking group in the Sierra Almijara. The weather has been fantastic. Scarcely a cloud in the sky for over three weeks. Yesterday I explored two routes I have not previously done. Firstly the ascent from Acebuchal to El Fuerte, and then up once more to Cerro Verde. The path to El Fuerte is now a good one, although somebody has put up large ugly signs saying private property. However, the path has been recently cleared and cairned, so at this stage I don’t understand this. I will need to make some enquiries, as this is a fabulous ascent which I would like to use again. I don’t claim any degree of perfection in my work. Anybody can make mistakes! But it is gratifying to receive some compliments about my work, and here are some extracts from emails I have received recently. “ I only did one walk from your book ……….. that was the Sedo de Mabro option to Walk 26 (Cares Gorge). The only addition I would make is in the last paragraph and it’s for reassurance to say that you cross the stream about half way down then re-cross it 3 times more by the bottom. I loved it. For a contribution of £8 towards my costs, I will send you by email a comprehensive set of directions for 30 walks in this area along with sketch maps. I will also try to give you tailor-made instructions to meet any specific requirements you may have. To proceed, email me on info@spanishtrailsco.com and I will tell you how. Gradings are: VS – very strenuous; S – strenuous; M – moderate; E – easy. The gradings are subjective, as what one person finds easy another may find difficult. The distances and ascents are approximate. Although care has been taken in preparing this information, no guarantees are given as things can change. Walkers undertake these walks entirely at their own risk.